Pagure is split over multiple components, each having their purpose and all but two (the core web application and its workers) being optional. Before going into the overall picture, one should realize that most of the components listed above are optional. The core application is the flask application interacting with gitolite to provide a web UI to the git repositories as well as tickets and pull-requests. This is the main application for the forge. Interacting with git repos can be a long process, it varies depending on the size of the repository itself but also based on hardware performances or simply the load on the system. 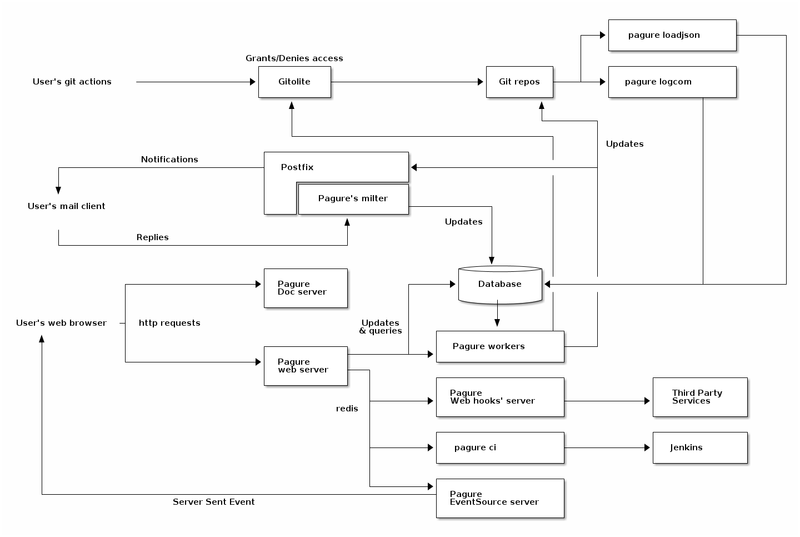 To make pagure capable of handling more load, since pagure 3.0 the interactions with the git repositories from the web UI is performed by dedicated workers, allowing async processing of the different tasks. The communication between the core application and its worker is based on celery and defaults to using redis but any of the queueing system supported by celery could be used instead. Currently pagure uses gitolite to grant or deny ssh access to the git repositories, in other words to grant or deny read and/or write access to the git repositories. Pagure supports cloning over both ssh and http, but writing can only be done via ssh, through gitolite. While integrated into the main application at first, it has been split out for security concern, displaying information directly provided by the user without a clear/safe way of filtering for unsafe script or hacks is a security hole. For this reason we also strongly encourage anyone wanting to deploy their own instance of pagure with the doc server, to run this application on a completely different domain name (not just a sub-domain) in order to reduce the cross-site forgery risks. Pagure can be run just fine without the doc server, all you need to do is to not define the variable DOC_APP_URL in the configuration file. The milter is a script, receiving an email as input and performing an action with it. In the case of pagure, the milter is used to allow replying on a comment of a ticket or a pull-request by directly replying to the notification sent. No need to go to the page anymore to reply to a comment someone made. The milter integrates with a MTA such as postfix or sendmail that you will have running and have access to in order to change its configuration. Eventsource or Server Sent Events are messages sent from a server to a browser. For pagure this technology is used to allow live-refreshing of a page when someone is viewing it. For example, while you are reading a ticket if someone comments on it, the comment will automatically show up on the page without the need for you to reload the entire page. Sends notifications to third party services using POST http requests. This is the second notifications system in pagure with fedmsg. These notifications are running on their own service to prevent blocking the main web application in case the third part service is timing-out or just being slow. The flow is: the main pagure server does an action, sends a message over redis, the web-hook server picks it up, build the query and performs the POST request to the specified URLs. The load JSON service is an async service updating the database based on information pushed to the ticket or pull-request git repositories. This allows updating the database with information pushed to the git repositories without keeping the connection open with the client. The log com (for log commit) service is an async service updating the log table of the database on every pushed made to any repository allowing to build the data for the calendar heatmap graph displayed on every user’s page.